$12.95 kids 11 years and younger. The New Orleans Roll is one of Sushi Garden's most popular menu items. Deep fried crawfish in a spicy sauce, cucumber & avocado topped with masago. So Crispy! Stuffed with house crab-puff filling (cream cheese, crab, jalapeño and green onion), crab, avocado, panko fried, served with sesame chili sauce. Delicious! Sounds cliche' I know, however, their secret bake sauce this 'simple' California Roll is topped with explodes in your mouth and makes for a very satisfying taste. I implore you to try it! Spicy Scallop Roll paired with a Salmon, Onion, and Crab Hand Roll. Fat pieces of scallop and the salmon melts in your mouth. Sriracha, a very spicy soy sauce, and wasabi mix to dip in background. Discounted appetizers, sushi, and drinks. 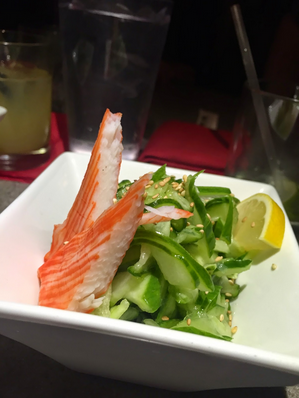 Whether you're looking for a nice spot for date night, girls' night out, or dinner with the fam, Sushi Garden will accommodate you and your guests. Service is always on point!